If you haven’t been living in a forest for the past year, you’ve undoubtedly heard of Bitcoin. You may have even read that it’s been trading for more than $900. And it’s true. A Bitcoin was trading for around $13 at the beginning of 2013 but by the end of the year had gone to about $900. Bitcoin is a cyber currency. It is the first monetary system that was designed specifically for the Internet. It was not created by either a company or any government and is not regulated by any government. It is called “open source” technology in that anyone can inspect the Bitcoin network’s code for vulnerabilities and flaws and anyone can recommend improvements. Plus, anyone can transfer Bitcoins directly to anyone else. This makes it a network like Skype. It can transmit funds globally and almost instantaneously for a small fraction of what other payment providers including banks charge. The people who use Bitcoin champion its freedom from regulations and say that no government can create Bitcoin or meddle with it. It exists outside of the physical realm and is basically computer code. Unfortunately, this has made it a favorite in the drug trade. Numerous companies such as Overstock.com and even the Sacramento Kings accept Bitcoin as a means of payment. More and more companies are jumping onboard every day and accepting the currency. The online computer store, TigerDirect.com accepts Bitcoin as does the online gambling site, SatoshiDice. So do BitcoinStore.com, Memory Dealers and even local retailers such as Keystone Pet Place. In fact, there are hundreds of small retailers who will accept Bitcoin. You can find them on sites such as Coinmap, Spendbitcoins.com and useBitcoins.info. If you can’t find a store that accepts Bitcoin, you can use the currency to buy gift cards. Many gift card businesses accept Bitcoin and you can then use the gift cards at merchants such as Walmart, Target and Nike. As further proof of Bitcoin’s growing popularity, Tesla is accepting it as payment for its Model S electric car. And the San Francisco gaming company Zynga recently announced that it would begin testing Bitcoin as payment. There are three ways to get Bitcoins. You can buy them, trade for them or mine them. If you want to buy a Bitcoin it will cost you $960 as of this writing. But Bitcoins are like dollars in that they can be broken down into fractions. The system allows a Bitcoin to have eight decimal digits. This means that as the price rises, Bitcoin holders will be able to deal in milliBitcoins or even microBitcoins. As an example of this, if the price of a Bitcoin was $1000, a milliBitcoin would be worth one dollar. A $5 purchase would be 10 microBitcoin or 5 milliBitcoin. 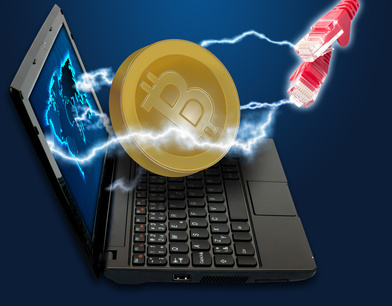 Bitcoins can be received and sent using a personal computer, a mobile device, wallet software or a web application. The most popular way to get a Bitcoin is to mine it. Even a computer novice can mine Bitcoin as all it requires is some specialized hardware and basic software. The software you would use to mine Bitcoin is simple and open source – meaning that it’s free to download and use. You would also need a Bitcoin wallet, which is an online bank account that’s encrypted and that you use to hold whatever Bitcoins you mine or buy. Unfortunately, these wallets are unregulated and susceptible to attacks. In fact, last year hackers did a Bitcoin heist where they stole some $1.2 million worth of the currency. And when Bitcoins are stolen or lost they are like cash – in that they are completely gone. The most popular mining software is GuiMiner. When you install and launch this software, it begins to mine on its own – looking for a combination that will open a padlock to a block of transactions. It keeps running and the faster and more powerful your PC is, the faster GUIminor will start generating Bitcoins. When Bitcoin mining was in its infancy, standard off-the-shelf PCs were fast enough to generate them. In fact this is the way things were set up, where it was easier to mine in the beginning but then harder as more Bitcoins were generated. Miners have had to move on to faster hardware over the last few years in order to keep generating new Bitcoins. In fact, many miners are now mining with application-specific integrated circuits (ASICs). This means the hardware is designed to do just one thing, which in this case is to mine Bitcoin. Bitcoin can be a very speculative investment. As noted in an above paragraph, the cost to buy one Bitcoin on a public Bitcoin exchange at the beginning of 2013 was around $13. However, by December it had gone to over $1200 and then ended the year in the $900 range. There were speculators who did very well in this market but be aware that price fluctuations of 20% or more in just one day are not uncommon. What grabbed headlines last year was the speculative nature of Bitcoin. But many experts feel that the most interesting aspects of this technology are yet to come. They believe that the Bitcoin network now parallels where the Internet was in 1994 and has similar promise. There is already a new generation of entrepreneurs who are creating companies with capabilities based on this new opportunity and this is expected to play out over the next couple of years. There are those who say that Bitcoin is the future of currency but others believe it is a Ponzi scheme or worse. Some countries such as Thailand and Iceland have been very hostile towards Bitcoin. The US has had a more tempered approach. As you might guess, one of the country’s biggest concerns is how Bitcoin activities will be taxed. At this point, the IRS has not provided any formal guidance in this area. It’s clear that Bitcoin is rapidly evolving and that before you jump into this new currency, it’s important that you do your own investigation and article research to determine whether or not it’s right for you or your business. Venture capitalists are beginning to put money into Bitcoin startups. For example, the venture capital firm Andreessen Horowitz invested $25 million into Coinbase – the company that provides merchant services and Bitcoin wallets. The personal finance app Mint now allows users to track Bitcoin transactions. This is seen as the latest sign that this unregulated currency is becoming increasingly popular in mainstream retail. The finance software company Intuit that owns Mint recently announced that its users can track their Bitcoin transactions along with their regular debit card and credit card activity, investments, check payments and ATM withdrawals. Mint has partnered with the digital wallet service Coinbase to track customer spending with Bitcoin. At this point, Coinbase has more than 12 million Bitcoins in circulation. Bitcoin could be a very good thing if you can successfully mine it. However, given its speculative nature, you may want to think twice or even three times before you buy any Bitcoins – especially as an investment. Bitcoin is just not for everyone just yet.